A few further Kraut notes while Aircraftman Bobby Bauer, above, pretends to fix a radio in March of 1942. When much of the world was going to war in 1939, Bauer and his Boston linemates Milt Schmidt and Porky Dumart were members of one of the NHL’s best-known and most effective forward lines. They finished the 1939-40 season as the league’s top three scorers — Schmidt had 52 points, Bauer and Dumart each with 43. That fall, under the Canadian government’s Compulsory Training Act, they reported for military training. As sons of Kitchener (Dumart and Schmidt) and Waterloo (Bauer), they joined the Scots Fusiliers of Canada, a unit belonging to North Waterloo’s Non-Permanent Active Militia. They spent two September weeks at the Thames Valley Reserve Army Camp in nearby London as members of A Company, along with Dutch Hiller and Ott Heller of the New York Rangers and Toronto’s Bingo Kampman — Kitchener boys all. 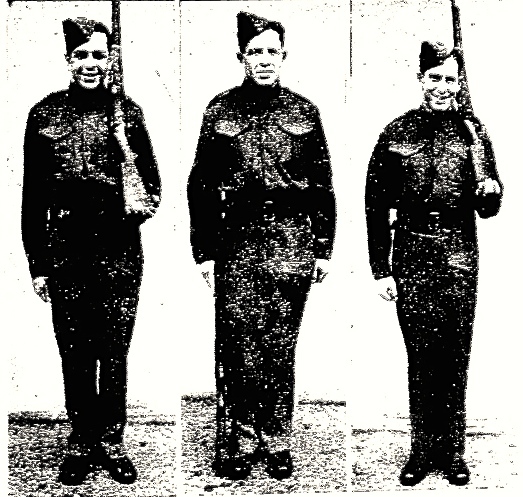 Dumart, Bauer, and Schmidt as Scots Fusiliers in 1940. Hiller’s background was, spoiler alert, Dutch, but never mind: all six players were seen as sterling examples of (i) big-time hockey stars pitching in to do their part in the fight for, as The Regina Leader-Post put it, “human freedom and international decency;” not to mention (ii) persons of German stock whom Adolf Hitler might have been hoping would support his aggression program, but no, sorry, they had nothing but contempt for both him and what he was up to, and were hoping and working for his downfall (The Leader-Post again). Other Bruins were in uniform that fall: defenceman Jack Shewchuk was in Brantford, Roy Conacher with his brother Charlie in Niagara-on-the-Lake. Flash Hollett was an NCO, pleased (he jibed) to have several Maple Leafs under his command. Boston manager and coach Art Ross expected that when the players reported for training camp in Hershey, Pennsylvania, in mid-October, they’d be in the best shape of their lives. And not just his team, either: the NHL would get off to its fastest start ever that year, he sincerely believed. Right or wrong, by season’s end, in April of 1941, Ross’s Bruins were beating Detroit to win the Stanley Cup. They kept it up in the fall and on through the winter. But then, with the Bruins holding on to first place, a shadow appeared on the northern horizon in January of 1942. The rumour out of Canada was that government was leaning towards universal conscription. From Kitchener came word that the Canadian Army wanted Dumart to report for duty within five days. No, not quite. As noted in The Boston Globe, “Woodrow (Porky) Dumart received notification to report to Military District No. 1 in London, Ont., for medical examination within three weeks.” Which of course he’d do, assured Art Ross: Woody like all the Bruins, was ready to serve when his country called. The Bruins were going to be in Toronto at the end of the month, and the Army could run a stethoscope over him then. 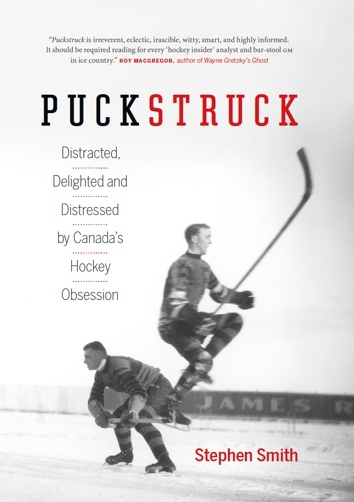 NHL teams knew that season that they were only borrowing their players for as long as the war didn’t need them: strictly speaking, they were bonded by the Canadian government to return any player within 48 hours once they were called to service. Would Dumart be the first of many to go? When all the hockey players were gone to war, what would become of the rest of the NHL season? After basic training, word was, the Bruin linemates could join their old unit, the Scots Fusiliers, or opt for another branch of service. Dumart said he was thinking of the Navy, but in the end of course all three Bruins signed up for the Air Force. There was some shock in Boston — among the sportswriters, anyway — when it came out that the high-flying hockey stars wouldn’t be frontline fighter pilots. Art Ross would later see fit to explain how he understood it. All three, he said, had taken their pilot’s tests, but Bobby Bauer was the only one to pass both the physical and scholastic requirements. Which earned him … a job devoted to the advanced study of radio detectors in long-range bombers. Schmidt passed the medical test, but because he’d only completed a year of high school, couldn’t qualify scholastically. So he was assigned a job as a physical training instructor. For Dumart, his eyesight wasn’t good enough for piloting. Following his RCAF medical, he was sent to an eye specialist in Montreal who told him he needed glasses. He’d studied accounting in high school, so that’s what the Air Force decided he could do. A little later it came out that Bauer could have avoided the RCAF and its radios altogether. In July of 1940, when he’d registered with military authorities, they were only looking for candidates aged 21 to 25. Bauer was 26, but in order to stick with his younger linemates in war as he had in hockey, he’d lied about his date of birth, giving it as February 16, 1916 when, as The Globe and Mail pointed out, every hockey guide since he’d turned professional said 1915. When this came to light — with Art Ross’ help? — military officials said they’d release him if he produced his actual birth certificate. Bauer wouldn’t do it. He’d given his age a twist (as the papers put it) so that he could serve with his friends.